of which started or terminated at Crewe, and some of which passed through Crewe to other destinations. 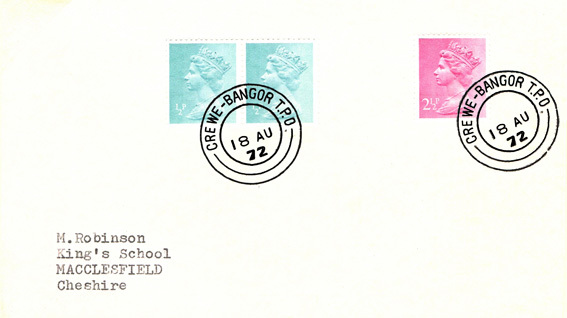 Here we look at the TPOs which had a handstamp/postmark showing the name ‘Crewe’ (i.e. those TPOs starting or terminating at Crewe). JU 16 02), but in the small L & C /S. C. (London & Crewe Sorting Carriage) handstamp. 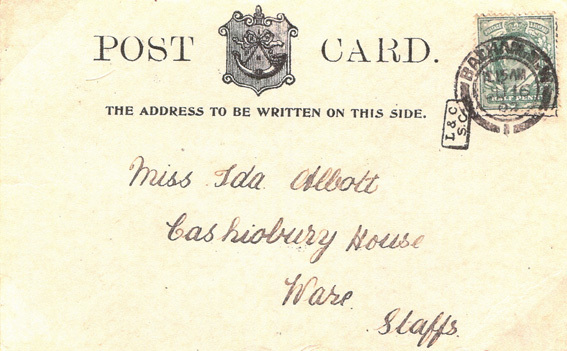 Note that the above example extends the known date of usage of this handstamp to 1902. 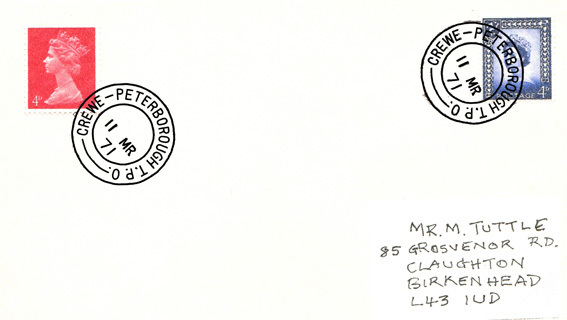 The next illustration shows the handstamp used on the London & Crewe Sorting Carriage, Down (London to Crewe) Day Mail run. The Crewe Birmingham TPO services started on 12 July 1885. 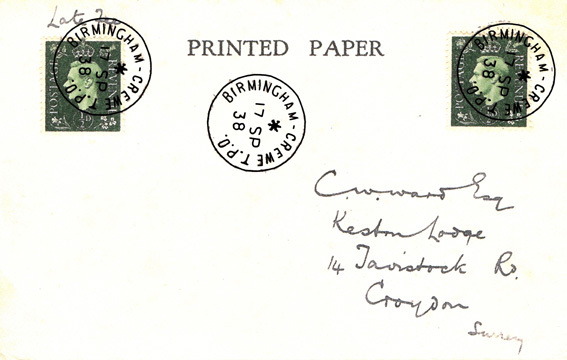 Here we show the handstamp of the Birmingham Crewe TPO being used not only to to cancel the normal postage stamps, but also to cancel the extra stamp used to pay the Late Fee. 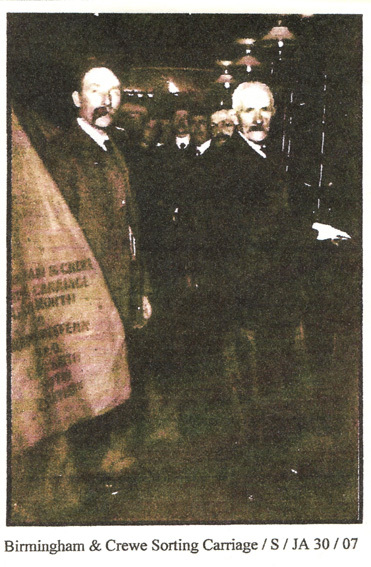 After the last normal daily mail collection had closed for the day, it was still possible to post a letter at a Railway Post Office, and even to post it directly into a Travelling Post Office stopped at the station. However, this ‘late’ service (introduced in October 1863) was subject to a Late Fee of 6d (old pennies). 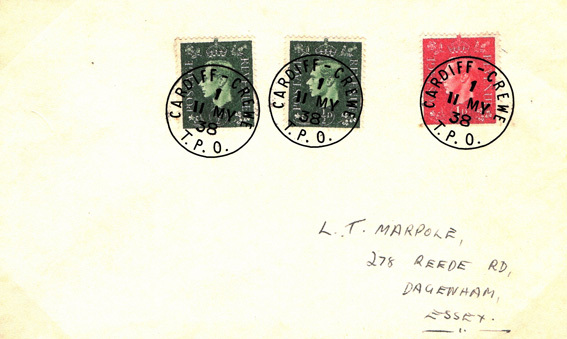 A stamp (or stamps) to the value of 6d had to be added to the letter or postcard to show the Late Fee had been paid. 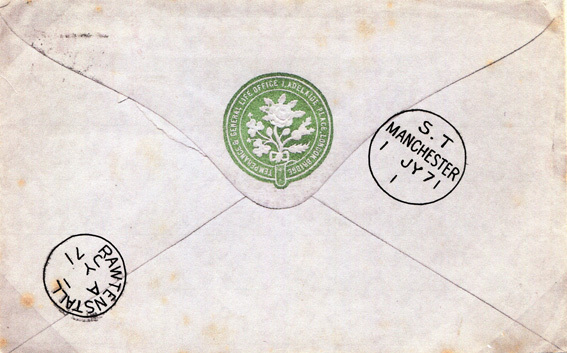 The cost of the Late Fee was gradually reduced until 1 March 1880, when it was lowered to 1d. From 1880, the cost of the Late Fee fluctuated between ½d and 1d until it was eventually abolished on 27 September 1976. 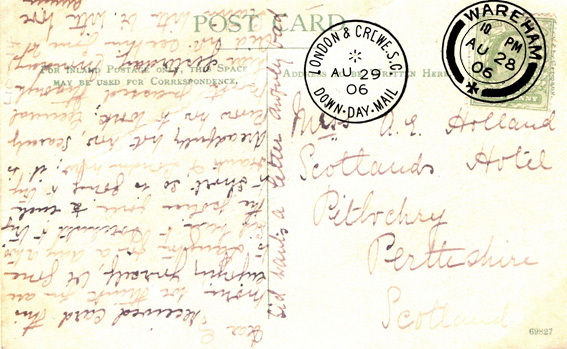 Some users of the TPO services affixed the Late Fee stamp in the top left hand corner of the letter or postcard (as in the example above). 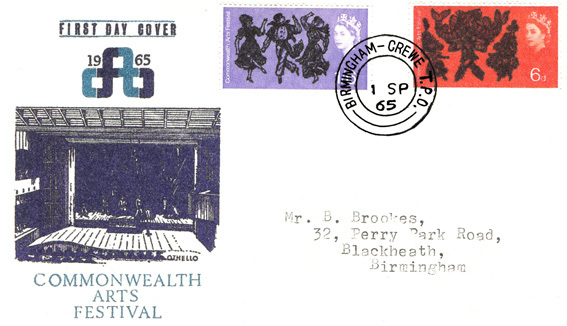 Next we have another variety of Birmingham Crewe TPO postmark – this time on a 1965 first day cover. The Birmingham Crewe TPO was withdrawn shortly afterwards (on 6 March 1967) as a result of the re-routing of the Up Special TPO and Down Special TPO through Birmingham. Before we leave the Birmingham Crewe TPO we can show you the inside view of the carriage as long ago as 1907! This service started on 4 October 1920 as the Crewe Cardiff Sorting Carriage and the Cardiff Crewe Sorting Carriage, and ended (as the Crewe Cardiff TPO and the Cardiff Crewe TPO) on 15 May 1988 when it was amalgamated with the Shrewsbury York TPO. However, this amalgamation did not last long, and the Crewe / Cardiff TPO service was re-started on 31 May 1994 – only to be finally withdrawn on 27 September 1996. 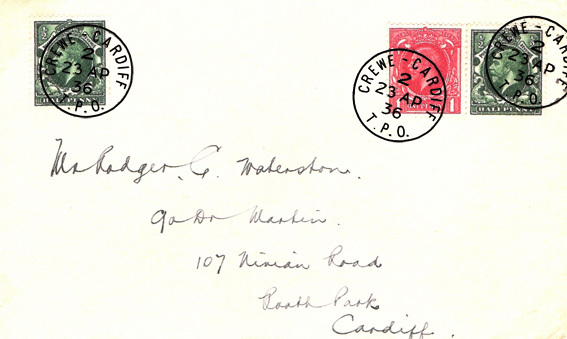 Here we show postmarks from the TPO going in each direction (Crewe to Cardiff and Cardiff to Crewe). The Crewe to Glasgow service was introduced on 15 December 1926 as the Crewe Glasgow Sorting Railway Carriage (effectively taking over the route of the Preston Glasgow Railway Sorting Carriage). 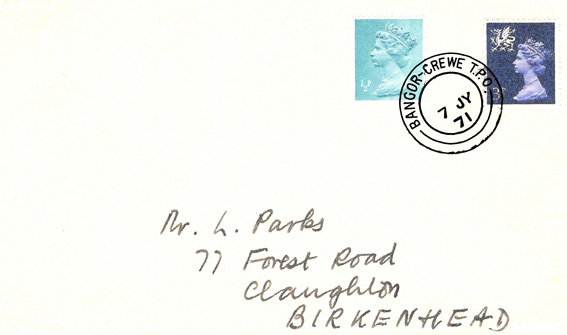 The service was eventually withdrawn on 14 May 1992. 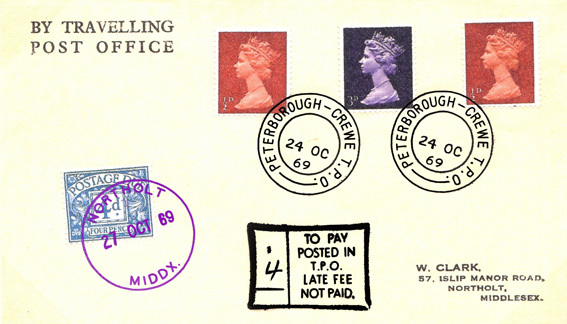 … and here we show postmarks (dated 24 October 1969) of the TPO going from Peterborough to Crewe. 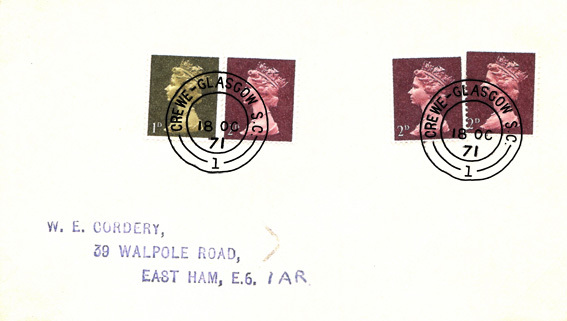 This example has the added interest of a Late Fee Not Paid hand stamp accompanied by a 4d Postage Due stamp (cancelled at Northolt on 27 October 1969, in mauve ink ). There will be another POSTAL DISPLAY COMPETITION at the 2019 Annual Convention. Why not send your own entry in … you could WIN!